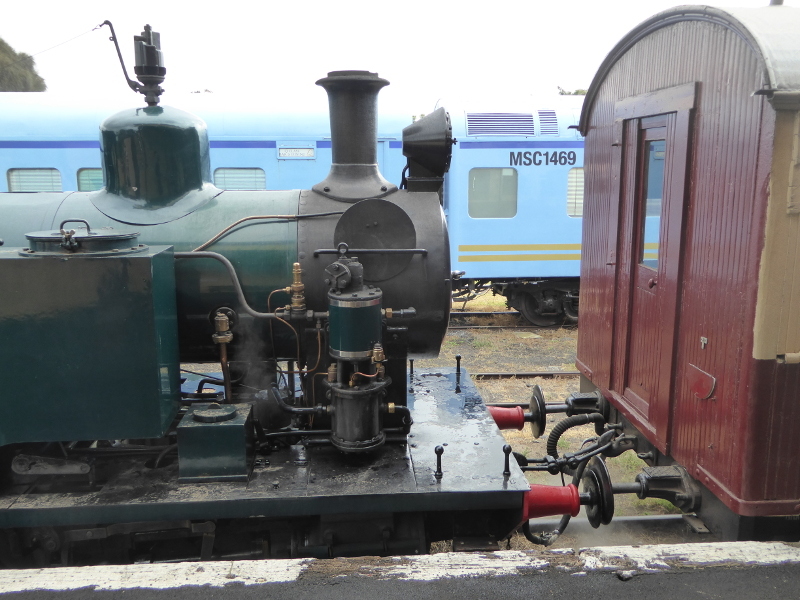 We didn’t have to wait long on Queenscliff Station before the little steam engine shunted its vintage carriages alongside the platform all set for us to board. The station itself is worth a few minutes to admire; built in 1881, with recycled rail tracks supporting the cover over the platform, and a few nice pictures up in the ticket office. Apparently there was a foot warmer shed once too, I guess for those freezing days when people’s boots left your toes icy if you had to wait around for any length of time. 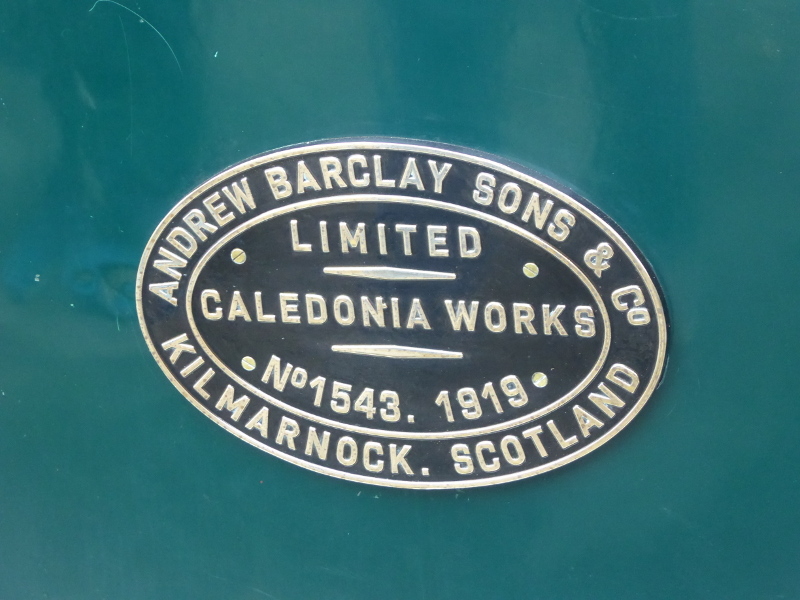 We were delighted to see that the steam engine had been built in Kilmarnock. It’s not Scotland’s prettiest town, but we had driven through it only a week earlier so it felt like home to see the Andrew Barclay Sons & Co shield on its side. 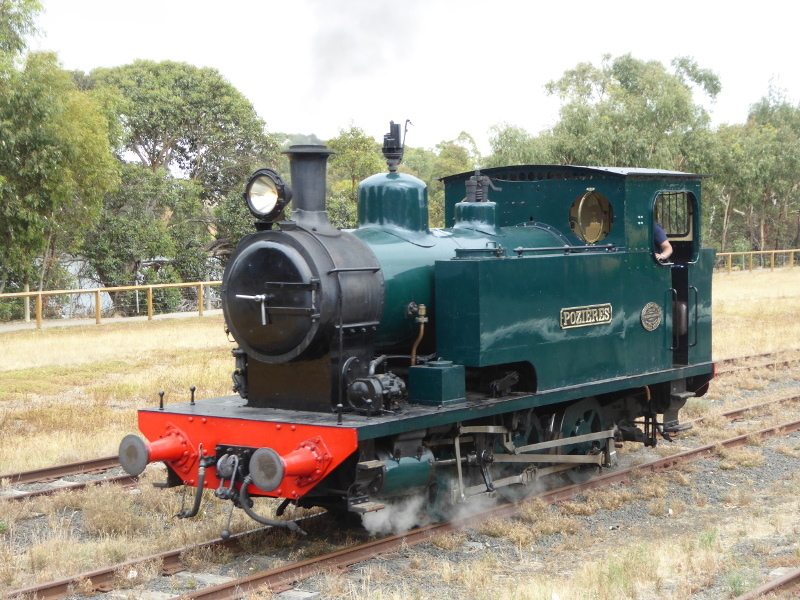 ‘Pozieres’ was the name of the engine, built in 1918, just two years after the infamous Battle of the Somme, in which Pozieres was a village where many Australian soldiers fought. 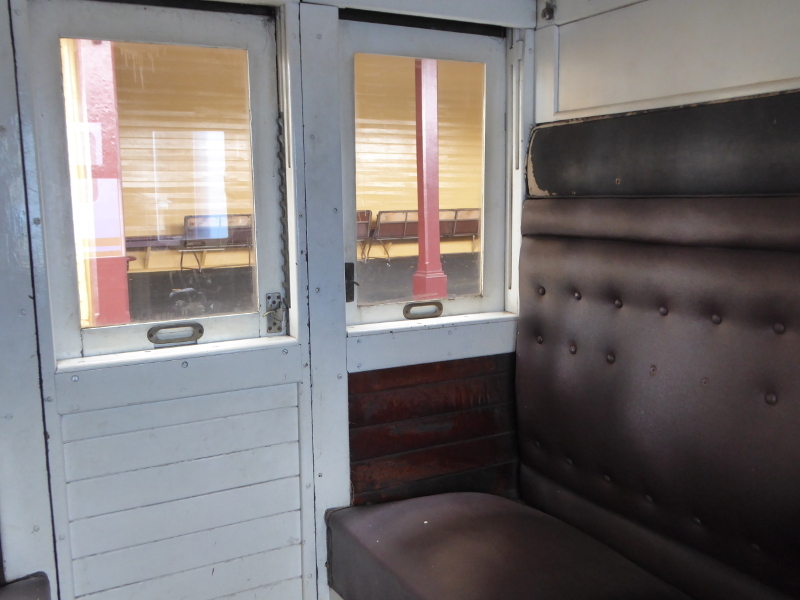 There was a choice of carriages (all 1940s vintage, I think), either open or with compartments. 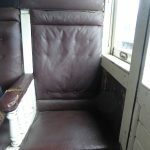 We chose a compartment with a rather majestic (though very sinkingly uncomfortable) arm chair probably for those who needed a help to stand up and get off the train. There were leather straps as hinges on doors you can’t open unless you open the window and reach out for the handle (bringing back memories of British carriages circa 1980 when many a foreign tourist would miss their stop as they just couldn’t fathom how to get off the train they were in). 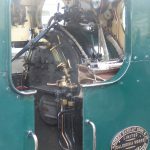 We heard the engine gearing up five minutes before departure, with a crashing regular beat reminding me of old boilers we had in our Yorkshire home which always sounded as if they were about to take off when they got into action. 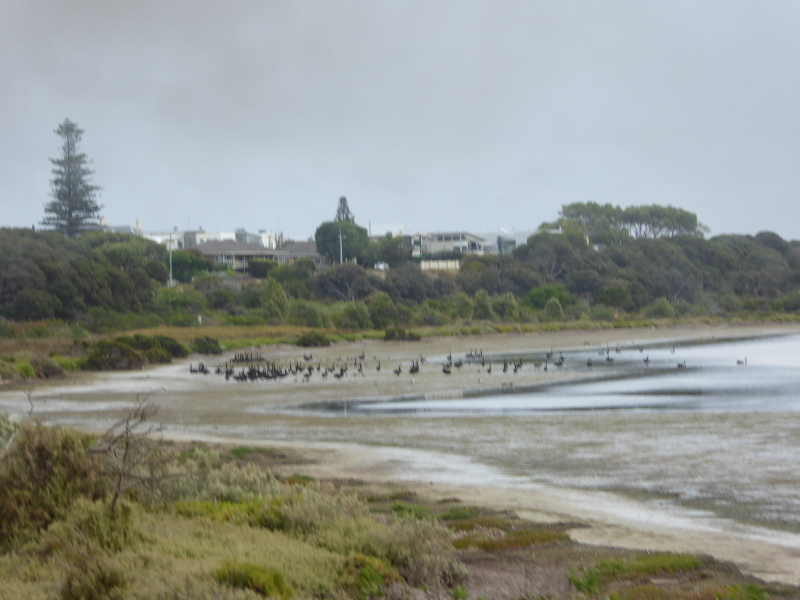 We trundled past Swan Bay, quickly seeing how it got its name, with hundreds of black swans lining the beach here. We strolled (well the train is really slow at this point) past the yacht club, waving at onlookers, past the Victorian fisheries authority building, and then we hit a swampy section, with lots of little rock pools covered in millions of flying creatures – not somewhere I’d fancy fossicking around in the heat. 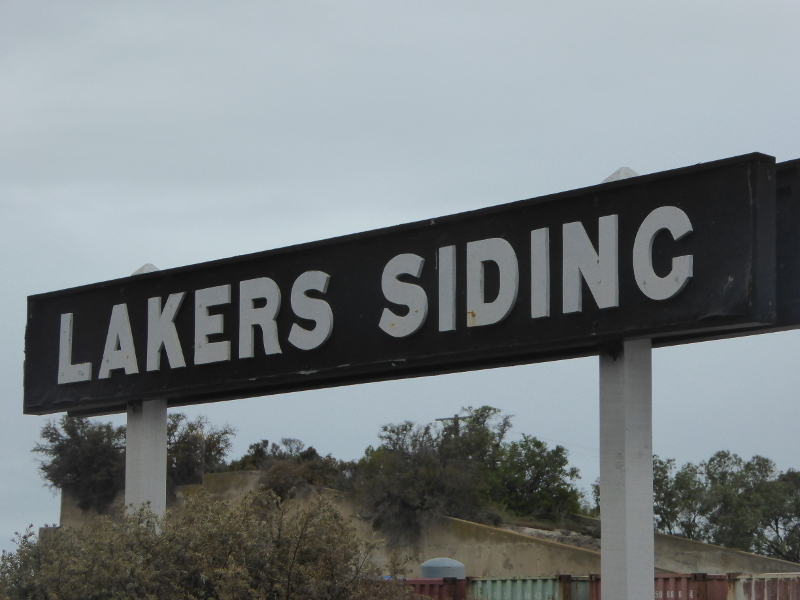 We then left the bay and passed (without stopping) Lakers Siding (once the only destination from Queenscliff, when the vintage railway reopened). 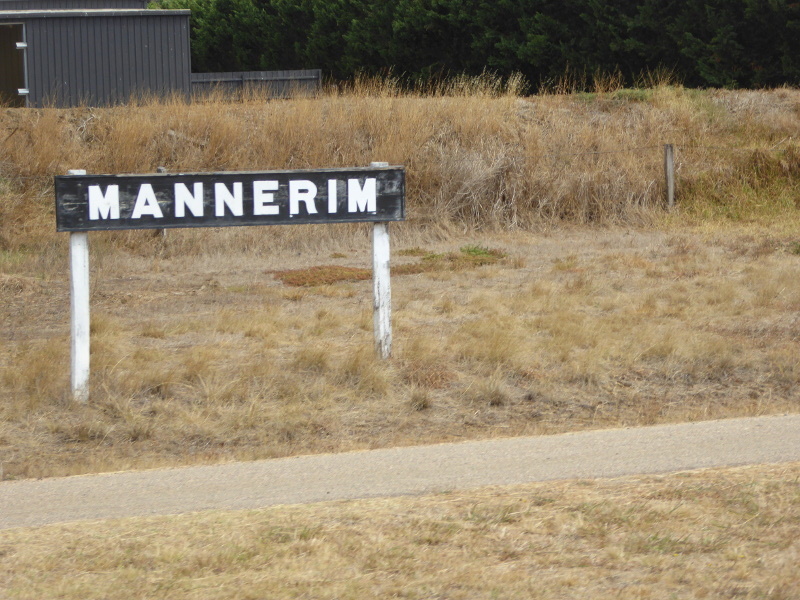 We passed the carriage maintenance sheds and then trundled through farmland: there were free range chooks with a livestock guardian dog (a bit like the Warrnambool maremma dogs); alpacas running away from the train, and lots of cows grazing in the fields. Behind Suma Park station ( we didn’t stop here either) there was a vineyard and all the way alongside the railway was a rather good cycle trail. But it was a proof of just how slow we were travelling that most bikes zipped past us (even if that track here looks a lot easier than our local Castlemaine-Maldon rail trail). Next up, on our right, was a lurid green tennis court, and then we did go past a Dad cycling with his pink daughter on the back seat, so maybe we picked up speed here. Around Mannerim Station there were big wombat burrows beside the line (but I’m still yet to see a live wombat in the wild). Out of Mannerim, the engine begins to work hard: – climbing, chugging away furiously, but still with enough energy to belt out an enormous toot of the horn. But then we almost came to a standstill: did it literally run out of steam with that blast of the horn? But no, we made it to the ‘summit’ and rolled gently down the last 3 or 4 kms to Drysdale. 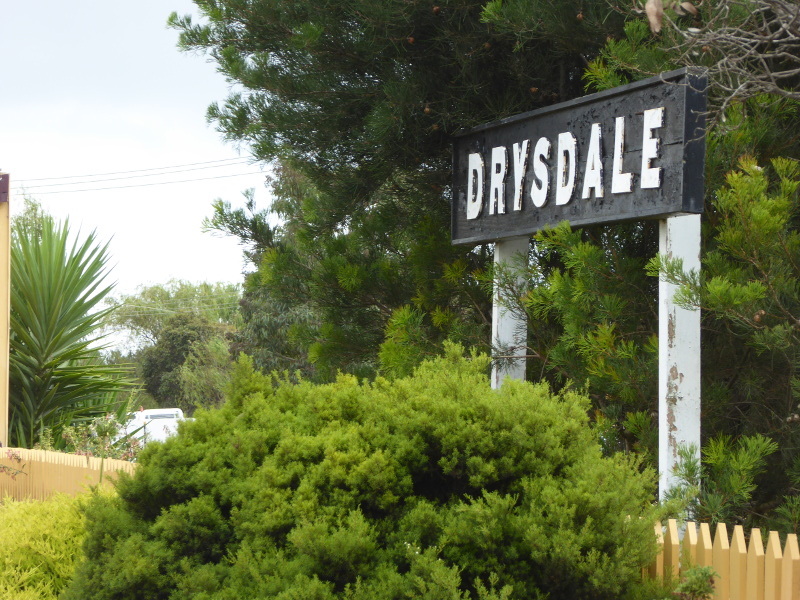 Entering Drysdale, people were on their balconies waving as the train went past. There was an equestrian event in full flow on the left side and then we spotted Lake Lorne, which is right by Drysdale Station and we knew we had arrived. 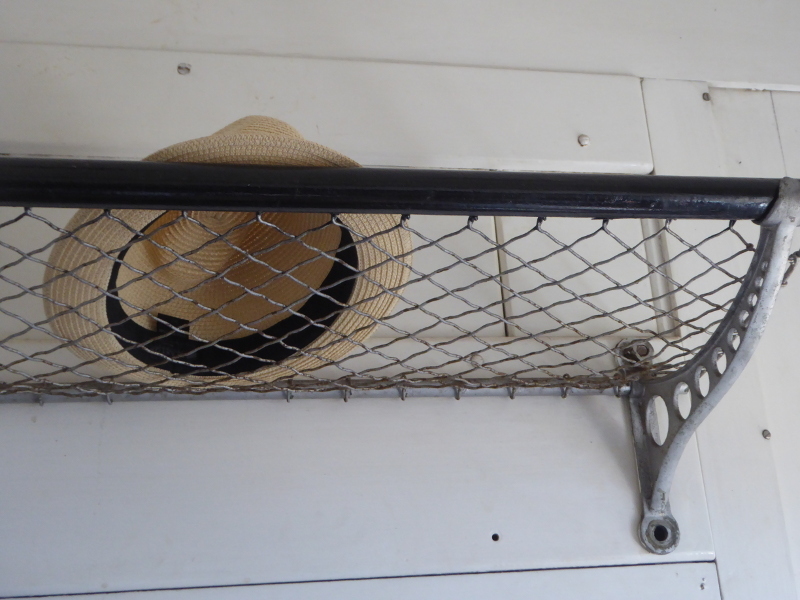 For the journey back, we chose an open carriage, with two big excited families on board. 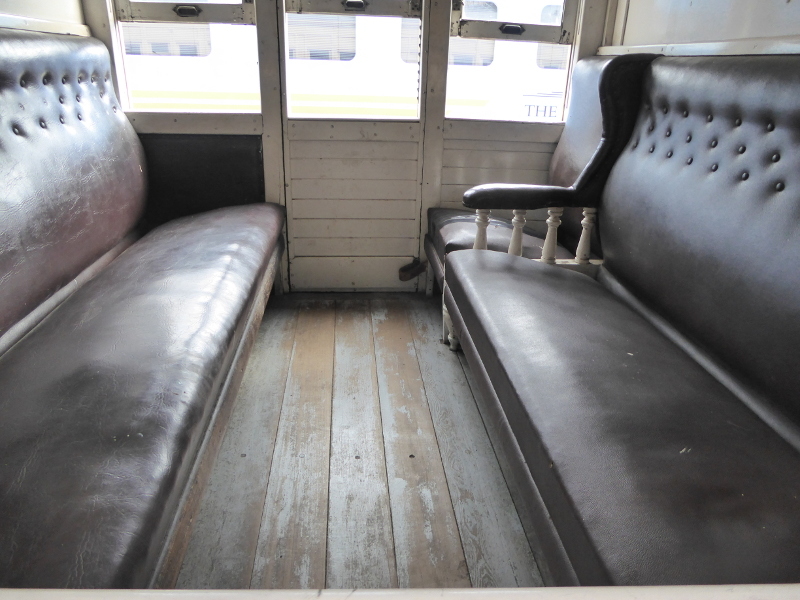 There are bench chairs across the width of the carriage so choose your seat and then stay there – there’s no aisle to move along and individual doors for each bench to get on and off. 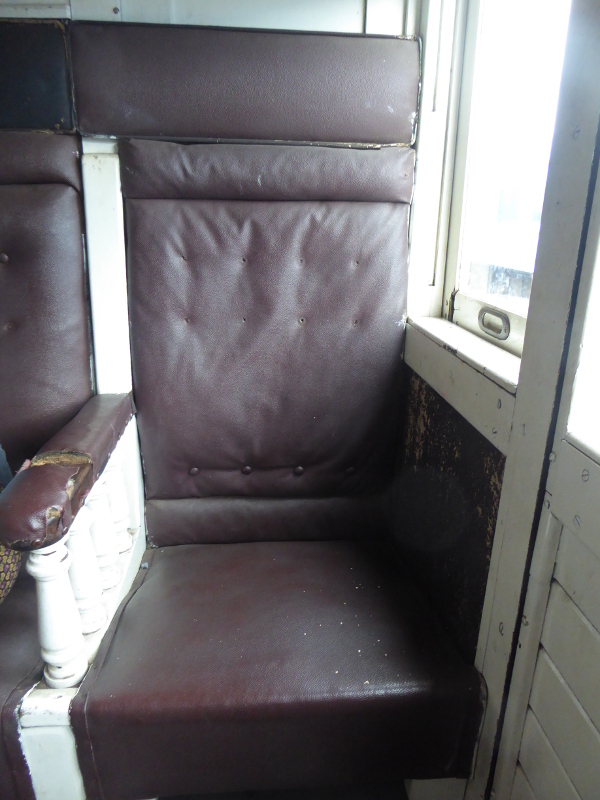 You probably could once fit 12 to a section – 14 at a squeeze – so the carriage as a whole seats 72 minimum. But there was no need for that on this quiet day in March. No toilet facilities on board. 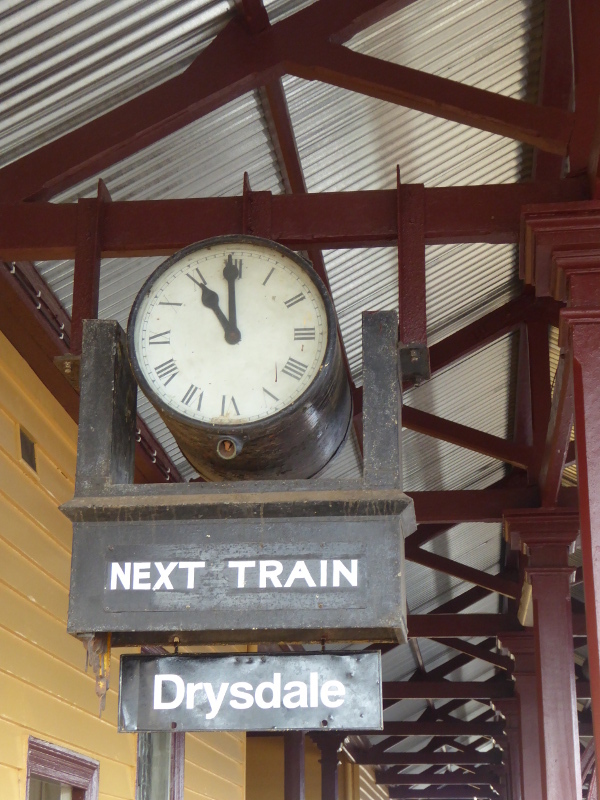 $30 return with 20 mins at Drysdale. 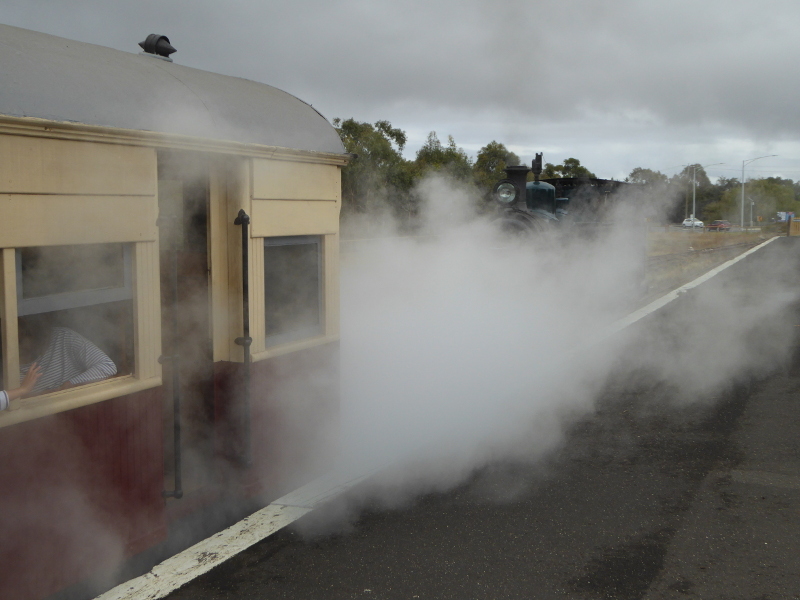 For schedules and lots of info on special days on the railway, check the Bellarine Railway website. The Queenscliff to Geelong railway line was opened on 21 May 1879 by the Governor of Victoria, one Marquis of Normanby, a Yorkshireman like myself. There was no station yet in Queenscliff, as the site on which the station now stands was then occupied by local fishermen. Queenscliff Station was built in 1881. 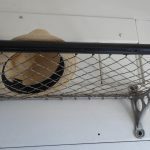 Once special excursion trains were introduced, the Geelong Advertiser ran an article in 1905 which read a bit like my own tale of our day along the railway in 2019. The reporter was struck by just how many ladies there were on the day trip, and many of them were very fussy about not sitting anywhere near smokers (who tended to be men). 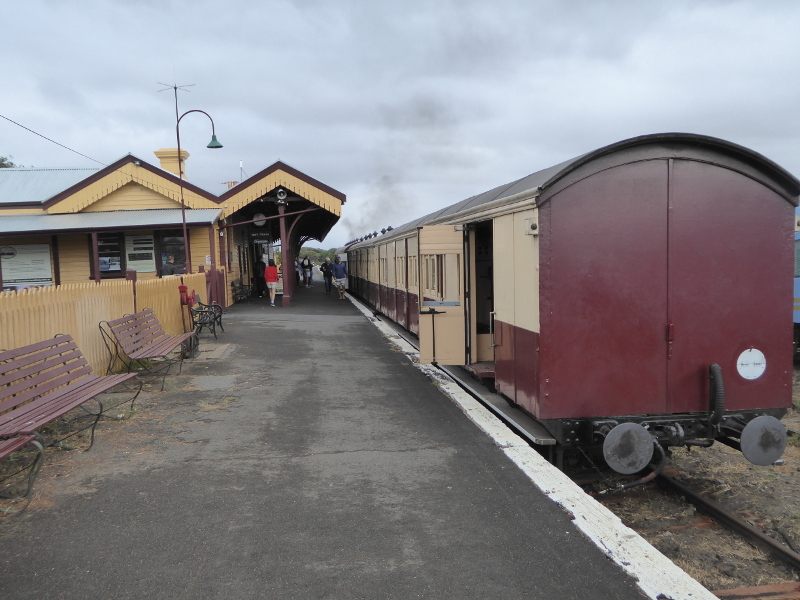 I’m not sure the locals in Queenscliff were too impressed by the fact that most of the 400 or so people on the train came with self-catering picnics, so there wasn’t much extra business for the shops in Queenscliff from some of those excursion trains. 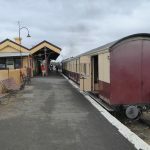 In 1908, when the US Fleet was visiting and thousands were expected to visit Queenscliff to watch the ships go through the Heads, the Railways people put on nine special trains, but they didn’t have enough carriages and warned passengers that some would be carried instead in cattle trucks, with a step ladder to help them off the train. Oh, and Queenscliff station was said to be too small to take all the crowds arriving at the same time, so some of these step ladders would lead folk down to the tracks ‘some little distance from the station’. I guess it was not every day you got to see all those warships sail past…Information boards tell us today that 6,900 passengers passed through Queenscliff that day. 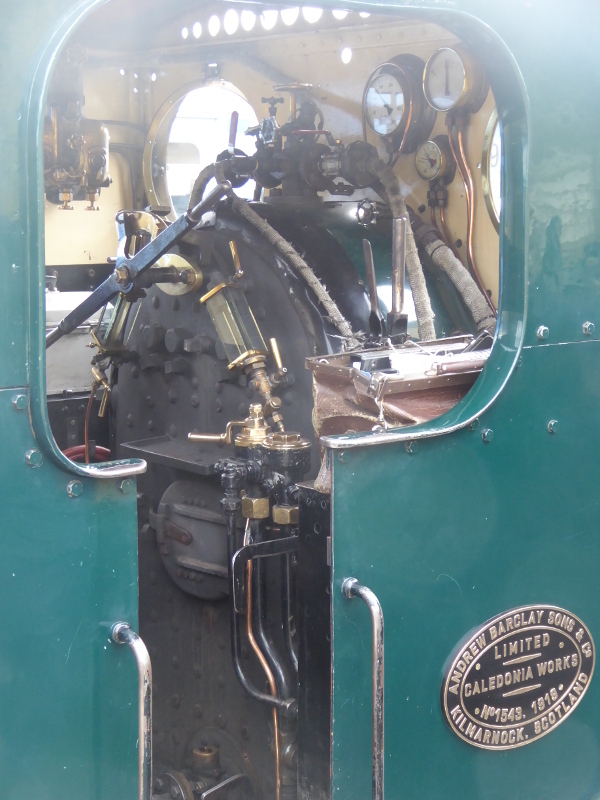 100 years ago, the rolling stock must have been a little different from those carriages we travelled in this year. An unfortunate man called Farrell was in conversation with three fellow travellers on their way to Queenscliff when he leant back too far and fell onto the track, breaking his neck in the process. At the inquest, it was found that no blame could be attributed to the railway staff or department since there were ample seats available but these gents had chosen to stand on what was called the carriage ‘platform’ instead. I wonder how those carriages looked back in 1921? 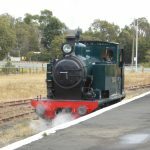 Looking at reports of special holiday trains to Queenscliff, it looks as if the Drysdale to Queenscliff section used to take about 25 minutes, so was about twice as fast as the current 21st century Bellarine Railway! The so-called ‘excursion trains’ were a bit vulnerable to the uncertainties of Victorian weather, though. 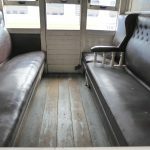 350 one year was considered a good number on board, but poor weather in 1921 meant one excursion only attracted 32 fares from Geelong to Queenscliff, though I noted from a local newspaper article that a picnic party of 90 (!) got on at Drysdale. Big picnics in those days. By the early 1930s, it was a classic tale of the roads improving and people choosing their own motor transport over the railways. It seemed to be the shifting of fishermen’s trade that sounded the death knell for the Queenscliff line: 1928 saw 37,313 boxes of fish sent from Queenscliff to the markets in Melbourne, but by 1931 the lorry companies were offering new vehicles with cold storage and faster travel times than the rail could manage. 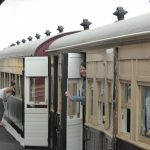 But passenger numbers had already dwindled, with reports in 1931 suggesting the average number of passengers was just 6 for the morning train and 16 for the evening train home to Queenscliff. Not all visitors to Queenscliff were as charmed as we were by the place, either. The Werribee Farmers’ Picnic visit in 1898 reported back that the Queenscliff Railway Station was one of the dirtiest they had seen and Queenscliff as a whole “about as ugly in natural scenery as Sandridge Bend (Port Melbourne as we know it). In 1959 the line was closed to passengers and the line closed completely in 1976. 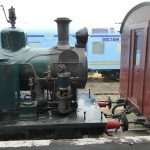 But the Geelong Steam Preservation Society immediately got to work saving track and rolling stock, and working to reopen as a tourist line. The first section reopened already in 1979 (Queenscliff to Lakers Siding) and it extended to Drysdale not long after. The line has appeared in lots of TV programmes with a historical setting, including the Australian family drama The Sullivans! 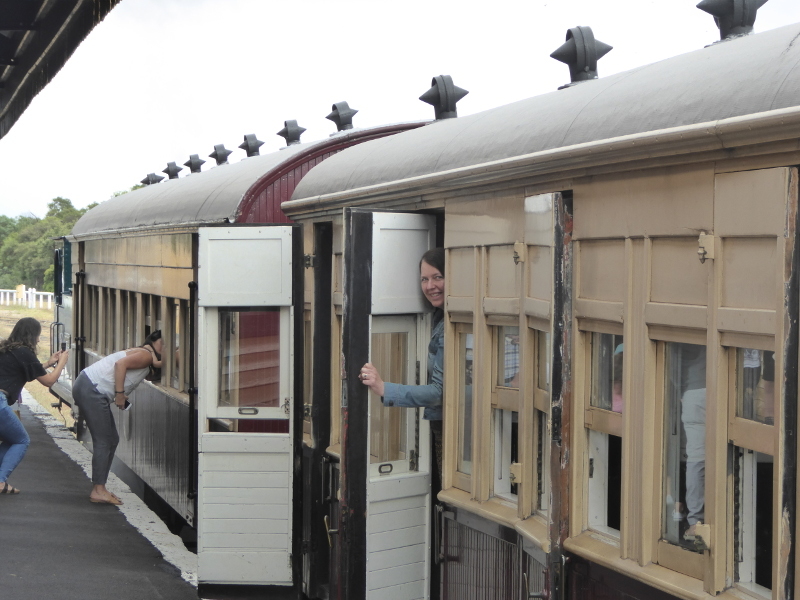 What are your memories of the Bellarine Railway or Queenscliff Station? 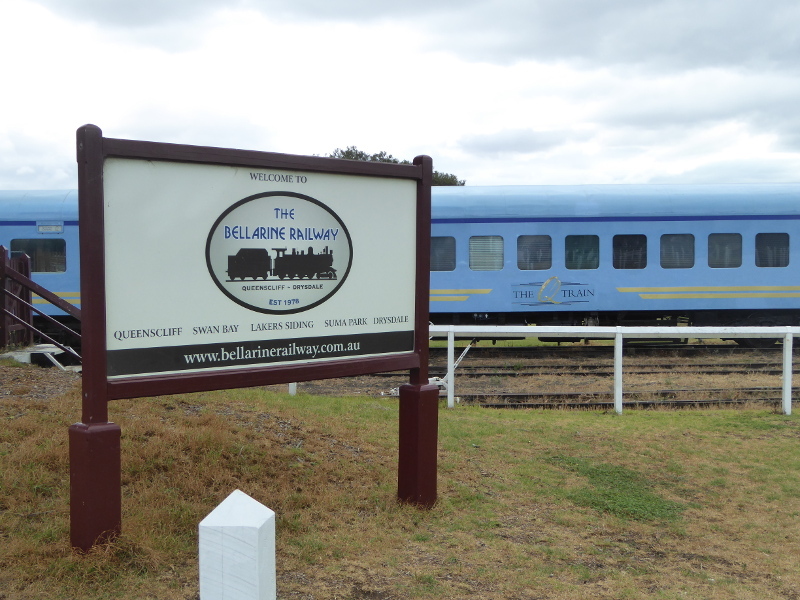 Have you had a trip on the Bellarine Railway? What was your favourite part of the experience? Or did any of your relatives ever speak of earlier days when the railway was still relatively operating a service between Queenscliff and Geelong? 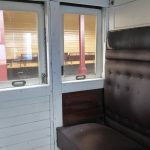 The Stations Past website has an entry on Queenscliff Station, with some old photos from when the station had just closed to regular services in 1977. 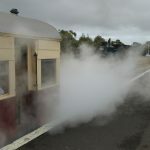 The Tot Hot or Not website – with tips for trips with small kids – had a good day out on the Bellarine Railway on a day when Thomas was doing the trip on loan from Puffing Billy. Thomas managed the round trip in 45 minutes! 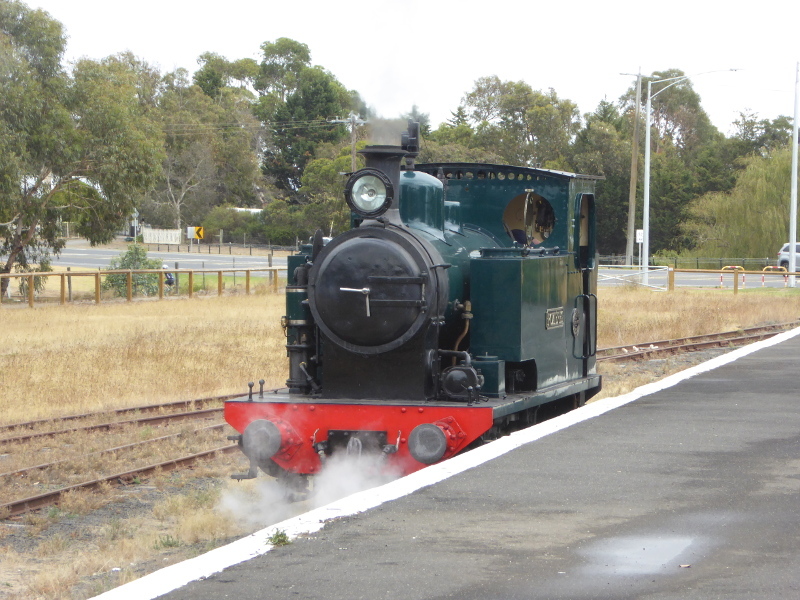 The Bellarine Kids website also gave this vintage railway the thumbs up. 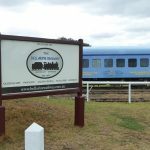 This Goldfields Guide website has a really good list of heritage railways, with a brief entry on the Bellarine. 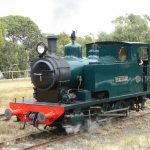 The Hallett Cove Southern site is from an American railway enthusiast who included some nice video clips of the Bellarine Railway in action. We had a really top quality coffee in Queenscliff’s main street (Hesse Street) at Belsize & Co. Open Sundays as well, and not too busy that we risked missing our train. 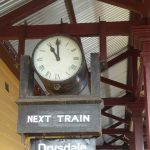 So well worth fuelling up because there is nothing on the train itself and no time for coffee if you get the train straight back from Drysdale.